Microsoft is calling the future gaming launch of Windows Phone 7 bigger than the launch of the Xbox 360. Microsoft's upcoming attempt to make the Xbox 360 experience mobile is coming in November when the company launches Windows Phone 7, its new mobile OS, in nine cellphone models. According to Microsoft, the gaming launch lineup for Windows Phone 7 will be bigger and badder than what was seen with the Xbox 360. Kevin Unangst, senior global director for Games for Windows, told TechRadar that Microsoft is "fully thinking of [Windows Phone 7] as a games console." He also said: "We're going to have a launch portfolio of games that's bigger than the one we had with the Xbox 360." That might not be saying much, but it is an indication that Microsoft is hoping to get the attention of gamers with Windows Phone 7. The Xbox 360 had almost 20 games at launch, including Call of Duty 2, Condemned, Gun, Kameo, Perfect Dark Zero, Amped 3, and a bunch of sports titles. If Unangst means that the games coming for Windows Phone 7 will be of a higher quality, he could be right, as it wouldn't be incredibly hard to beat out a bunch of ports and a few rushed titles, aside from the standouts in the bunch like Amped 3, Condemned, and Call of Duty 2. 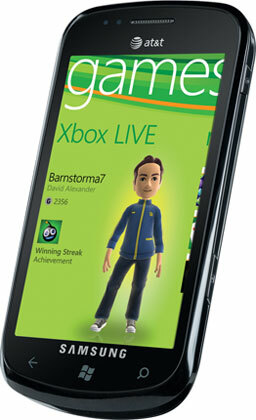 Launching with Windows Phone 7 will be games such as EA's Need for Speed: Undercover, Sims 3, Tetris, and Monopoly, all Xbox Live enabled to allow players to increase their Gamerscores and communicate with Xbox Live friends. The cutest game ever, ilomilo, was also announced as an AT&T Windows Phone 7 exclusive, though the language used wasn't clear on whether it would be coming to XBLA too as previously planned. Microsoft says this is the "first stage in the development of Xbox on Windows Phone handsets," so even more features and games are apparently planned for the future. Even though the Xbox 360's lineup wasn't incredibly stellar, it would still take some really compelling games to get the majority of console users to need a Windows Phone like they needed the Xbox 360 five years ago.